We offer team coaching to intact teams which allows individual and team development in real time in team meetings and offsites. This provides an opportunity for intact teams to come together to discover, reflect and implement the elements of a high performance team in an environment that fosters constructive thinking, planning and action with a team coach that is experienced in business, leading teams and group development. 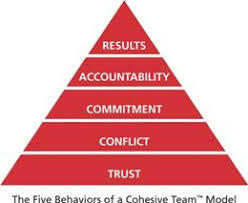 The team is able to work on a nominated area which may be of strategic importance, a project that is causing difficulties for the group or look at the day to day operating rhythm of the group and the dynamics around how we come together and get coaching on how working on individual and team mindsets, behaviours and skills that can promote team effectiveness. Team coaching fosters the performance and effectiveness of the team through building awareness of destructive and ineffective dynamics, creating strong team bonds, setting a constructive framework for engaging with each other through reflection, skill building and dialogue. Often this allows others to see what really drives and inspires others in the team which builds awareness and understanding of others. It also facilitates positive goal directed conversations that build the teams ability to create clear direction on important issues and engage in effective action to drive business results.